LEGACY BUILD 2018: International leaders enhance perspective by volunteering in U.S. Volunteers with the Fuller Center’s Global Builders program have contributed greatly to the home-building efforts in countries around the world — including such places as Haiti, Peru and Nicaragua. Representatives of those three Fuller Center for Housing international partners are in Americus, Georgia, this week helping Americans build homes for a change. Geral Joseph, who has done an outstanding job leading The Fuller Center’s work in Pigñon, Haiti, is enjoying a week of not being the boss as a volunteer at the 2018 Millard Fuller Legacy Build. “I’m very happy to come and see how the volunteers feel when they come down to Haiti.” Joseph said. “It’s the first time that I’m volunteering to build a house. It’s like giving something back to the American people because mostly they are coming down to help the Haitians. I think it’s my time to come help build a house. One thing Joseph learned is that it can get cold in Americus in April as the workday started with temperatures around 40 degrees. Jose Santos Rodriguez, who helps lead The Fuller Center’s work in Nicaragua could feel Joseph’s pain and then some. 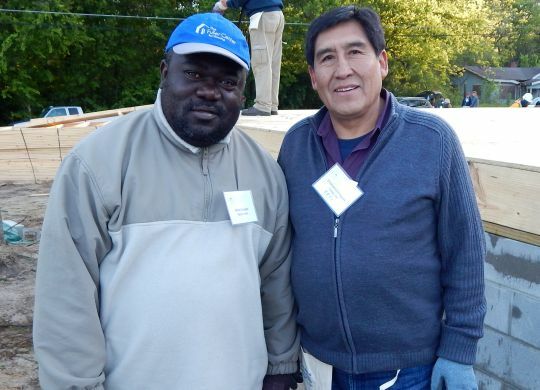 “I’m freezing to death,” said Santos, whose first visit to the United states, first plane ride and first trip out of Nicaragua was last April at the Higher Ground on the Bayou blitz build in Hammond, Louisiana. He was happy to return to the United States for another round of build — and he was even happier when the sun began to warm the job site by the time lunch rolled around. It also is a practical learning experience. Zenon Colque’s relationship with Millard and Linda Fuller goes back to the early 1980s, and he now leads The Fuller Center’s work in Peru. 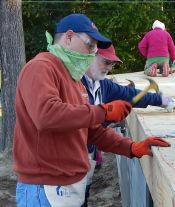 His last Legacy Build volunteer experience was in 2011 in Minden, Louisiana. This time, he brought along a Peruvian colleague, Vitaliano Enriquez, who handles accounting for the covenant partner in Peru. 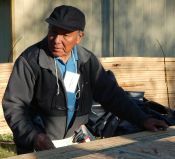 Colque’s experience with Millard and Linda Fuller’s affordable housing ministry dates back to the early 1980s, and he has spent much time in the United States. While he speaks English well, Enriquez knows almost no English but is finding that it is not a huge barrier on the job site. By the time these Legacy Build homes are dedicated at 4 p.m. Friday, they will be joined by leaders from The Fuller Center’s new partner in Puerto Rico and our leadership from El Salvador. View a photo gallery from Monday’s action at the 2018 Millard Fuller Legacy Build. Thank you all for coming to Americus, GA. to build two homes! The families are working hard along with local volunteers to complete their new homes. We will need more volunteers and more funding to complete the homes on schedule. We are almost to the point of drywall installation and finish work. So why not join us……very soon. Thanks, Jody Wade, Chair of ASFC.